After an oil spill on May 19 devastated Refugio State Beach and forced its closure, a massive clean-up effort took place. Refugio has since reopened and I have been curious to see how it looks. 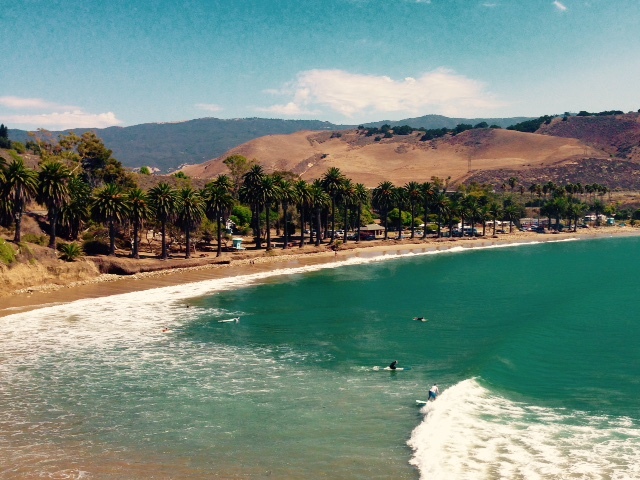 Surf’s up at Refugio State Beach, cleaned up after the oil spill of May 19, 2015. I happily accepted an invitation to join California State Parks Foundation board members and CSPF president Elizabeth Goldstein for a special tour to see the results of the considerable restoration work. Rich Rozzelle, District Superintendent for California State Parks, explained the huge clean-up effort that took place after the oil spill at Refugio State Beach. The Saturday morning tour was led by Channel Coast District Superintendent Rich Rozzelle, who told us and showed us that Refugio State Beach now looks pretty darn good. Surfers, stand-up paddlers and kayakers were enjoying their sports in the waters just offshore. It was wonderful to observe picnickers enjoying the beachside day-use area and a campground fully of happy campers. We were fascinated by Rozzelle’s insider account of the oil spill and its aftermath, and the way the ranger described the impacts on wildlife and the people who love this park—many of whom plan their annual family vacations around a stay at Refugio State Beach. A lot, really, if like me, you are strong supporter of our California State Parks. 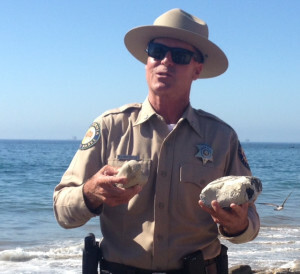 For we state park advocates, the disaster might be better termed the “Refugio State Beach Oil Spill.” The spill greatly affected this state beach as well as more shore under the stewardship of California State Parks—seven miles of coastline extending from El Capitan State Beach on the east to Arroyo Hondo Creek to the west. As I reported after my visits right after the spill, Refugio State Beach, a combo of sand and rocky shore with tide pools, was covered in goo. Particularly heartbreaking was the oil-soaked heart of the park: the sleepy lagoon at the mouth of Refugio Creek where there is a picnic ground under the palms. It was Paradise no more, to say the least. But that was then and this is now. Now that the beach has been cleaned up and new picnic tables installed, it’s time to look to the future for this park and the other 279 parks in the state park system. 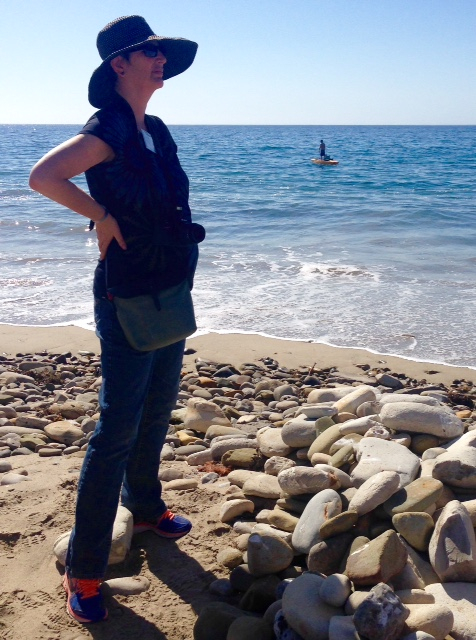 Keeping an eye on our parks: Elizabeth Goldstein, president of the California State Parks Foundation takes a look at the restoration of Refugio State Beach. The Foundation’s Elizabeth Goldstein spoke to the need to properly fund state parks. While ever-optimistic about parks, Goldstein admitted to being a little disheartened by the recent expiration of the federal Land and Water Conservation Fund (LWCF), which has been a major resource for state conservation, as well. Refugio State Beach and adjacent state parklands are perfect examples of parks that need funding. A primo coastal bike/hike trail connecting Refugio with its sister park El Capitan State Beach has been closed for more than a decade because no funds have been available to repair it. And for more than twenty years, state and local conservationists have worked hard to add to the state parkland along the Gaviota Coast (the last undeveloped and nearly pristine coast in Southern California) but have been unable to raise funds for land acquisition. State Parks supporters can be pleased by the disaster relief efforts on behalf of Refugio State Beach. And now it’s time to act for Refugio and all our parks by fixing what is broken and creating new parks and recreational opportunities for the next generation of Californians.